Sealcoating is the process of applying a protective coating to an asphalt surface in order to protect it from the elements, extend its life and prevent dangerous cracks from forming. 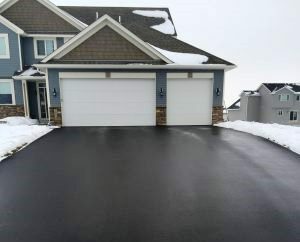 Seal King specializes in offering residential and commercial sealcoating services for those in Minnesota, Wisconsin and Iowa. We use our exclusive Seal King Sealer for each and every one of our sealcoating jobs, which combines a special blend of the best possible raw products, high performance additives, and special blackening agents. Our high quality sealer is one of the things that sets Seal King apart from other local sealcoating companies. If you’re looking for the best asphalt repair company for your specific needs, the answer is simple. Seal King Professional Sealcoating offers the best of the best in all aspects of asphalt repair. 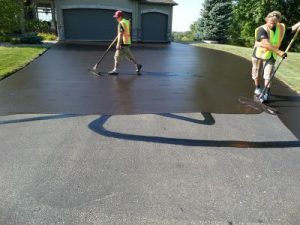 Founded in 1991, our dedicated team has been brightening the look and strengthening the performance of asphalt for both residential and commercial clients. As a homeowner, there’s a lot to maintain in order to ensure that your property stays in tip top shape. Yes, even your asphalt. 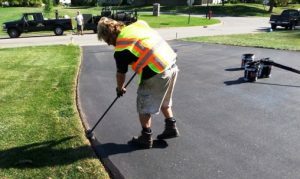 If the asphalt on your property has become worn down due to aging, weathering, heavy traffic, etc., teaming up with an asphalt maintenance company is an affordable option to consider. By choosing to partner with Seal King Professional Sealcoating, we’ll have your asphalt well maintained year around thanks to our top notch sealcoating services. Using a quality sealcoating company does not cost you more then doing it yourself. As we all welcome the spring, it’s time to also start thinking about your spring checklist. On the top of that list should absolutely include calling Seal King Professional Sealcoating and utilizing our professional sealcoating services. Sealcoating your driveway after winter is extremely important and our experts at Seal King are here to tell you why. The northland areas of Duluth, MN and Superior, WI have climate conditions that create additional problems for asphalt pavement for both residential and commercial properties. Asphalt Sealcoating maintenance should be done on a regular basis if you want to preserve the integrity of the pavement. Sealcoating is a great way to add a layer of protection from the damaging affects of weather, traffic, chemicals and UV rays. Seal King Professional hot mix asphalt crack sealant is especially geared toward optimal results when done correctly. This cost effective technique requires the right equipment and timing in order to achieve the desired benefits. After a long winter, many Wisconsin residents are feeling restless and ready to get outside and enjoy the nice weather. One of the first things that you may notice while driving around the neighborhood is dull, dingy, damaged driveways in need of a healthy coating of quality seal coat. 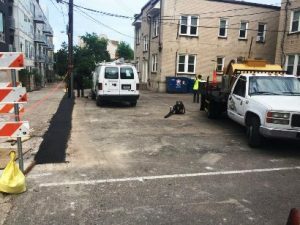 This cost effective asphalt treatment is often used by city engineers as a way to rehabilitate roadways before they are in need of more costly repairs. The Seal King Professional Sealcoating process can save you money by extending the life of asphalt pavement by several years. Our technologically advanced hot mix sealer provides superior coverage and protection when applied to asphalt driveways, parking lots and pavement. The winter months make for beautiful views with the white snow and ice that often accumulates. What goes on under that snow and ice however, can break down the driveway on your residential or commercial property. So, what type of affordable options do you have to protect your driveway after the winter months? At Seal King Professional Sealcoating, we have the perfect solution for you. By partnering with our staff, we can handle any repairs that were caused by Mother Nature during the winter, and we can also apply affordable sealcoating services to strengthen your driveway for seasons to come.